So you’ve been called to go on a mission trip! Following your passion and faith to serve a community far from home is an admirable project, but not a cheap one. Chances are you need to raise some funds to support your travel and other mission trip expenses. Custom t-shirts are a great way to fundraise for your upcoming mission trip! Regarded as one of the most dependable fundraising tools by nonprofits of all sizes, a t-shirt fundraiser can be particularly effective for individuals reaching out to their family, friends, and community. This makes t-shirts a fantastic mission trip fundraising idea! What platform should I use for my mission trip fundraising t-shirts? What are some mission trip fundraising shirt design trends? How should I offer my custom t-shirts to my supporters? How much can I raise with mission trip fundraising t-shirts? Eager to start raising money for your mission trip? 1. What platform should I use for my mission trip fundraising t-shirts? It’s the digital age — if you need to design, create, promote, or sell anything, there’s a tool for that. The choices can become overwhelming, especially with the concrete goals and deadlines of mission trip fundraising. When looking for a custom t-shirt fundraising platform, remember that any fundraising tool should make it easier to pursue your mission, not more complicated! Offering no way for supporters to directly order their own shirt. Requiring an unrealistically large minimum order of shirts. Forcing you to distribute all the shirts your friends order. As a custom t-shirt platform designed for fundraising, Bonfire is an excellent partner for your mission trip fundraising ideas! With some of the most flexible and user-friendly options available, raising money with Bonfire custom t-shirts is a no-brainer. For example, with a Bonfire custom shirt fundraising campaign, you’re not on the hook for placing a single bulk order and distributing all the shirts by yourself. Selling your mission trip t-shirts online should be easy, so Bonfire offers plenty of options to run your campaign your way. 2. What are some mission trip fundraising shirt design trends? Your mission trip fundraising t-shirt needs to be eye-catching! Your close family and friends will already want to support your mission by ordering shirts, but attracting support from the broader community can provide a huge boost to your online fundraising campaign. To catch this kind of attention for your mission trip fundraiser, focus on design! 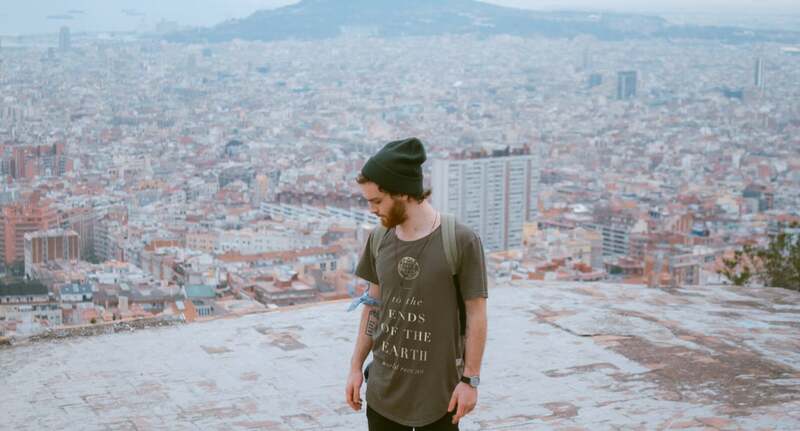 Check out our guide to the Top Mission Trip Design Trends, based on mission trip t-shirts created and sold through Bonfire’s fundraising platform! Next, follow our best practices on how to design a t-shirt. Think about your goals, the nature of your trip, and the kinds of design elements that will interest your friends, family, and members of your church. An effective mission trip fundraising idea will engage broader sections of your community, not just the people you’re close to! Keep exploring for more visual inspiration! We regularly feature some top nonprofit and personal fundraising t-shirt designs on Bonfire’s Instagram, so scroll through and take note of any designs that really stand out to you. Gathering inspiration from successful t-shirt designs is a great way to brainstorm ideas for your own. 3. How should I offer my custom t-shirts to my supporters? Once you finalize your perfect mission trip fundraising shirt design, consider the best way to offer your shirt to those who want to support your goals. Sell your shirts online through an individual crowdfunding campaign. Your friends, family, and any interested community members can order your shirt through a dedicated Bonfire page. The shirts will be printed and shipped directly to them — prepare for your trip instead of driving around town delivering shirts! Sell your shirts to raise money for your church’s mission trip fund. 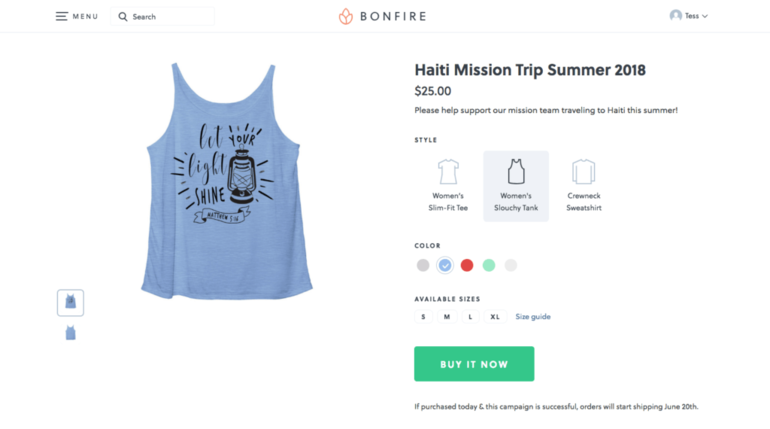 Bonfire even lets you offer shirts and collect funds to be donated to a nonprofit, like your church. This can be a smart idea for small groups all raising money for the same mission trip. Plus, Bonfire provides supporters the option to make an extra donation when ordering a shirt. Offer your shirts as a fundraising item for the nonprofit you’re going to serve. If you’ll be traveling in order to join a development project for an international nonprofit, Bonfire’s fundraising capabilities are a perfect match. Sell your shirts and collect funds to donate directly to the nonprofit managing your mission. Place your own direct order of custom mission trip fundraising t-shirts. With Supply by Bonfire, you can easily order as many custom shirts as you need for your whole missions team. That way everyone can wear their shirts during your travels, plus you’ll all share a memento from your life-changing experience! Any of these methods for offering Bonfire t-shirts can be an extremely effective mission trip fundraising idea! For both individual or small group fundraising projects, having these kinds of options allows you to make the smartest choices that best suit your goals. Be sure to weigh all your options when choosing which strategy for offering your mission trip shirts. 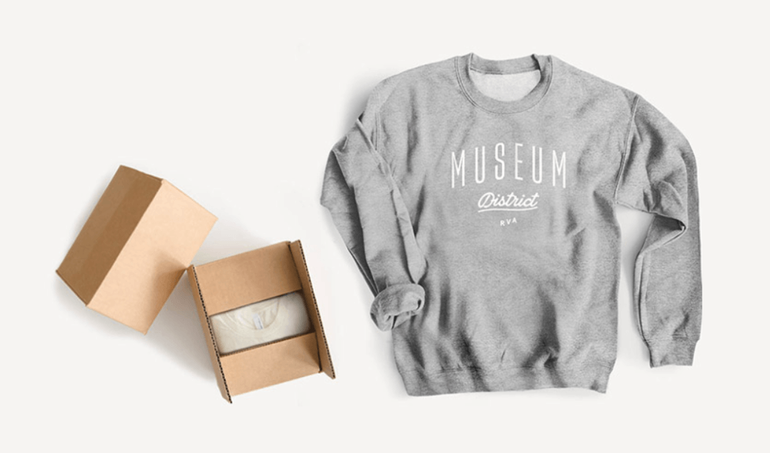 One deciding factor might be the fact that t-shirts your supporters order online through Bonfire will be delivered to them directly — you won’t need to ship them yourself. 4. How much can I raise with mission trip fundraising t-shirts? With a top t-shirt fundraising platform like Bonfire, the amount you raise is completely up to you! You’re already driven by your passion and faith to complete a mission trip. We believe that a fundraising platform shouldn’t slow you down along the way. 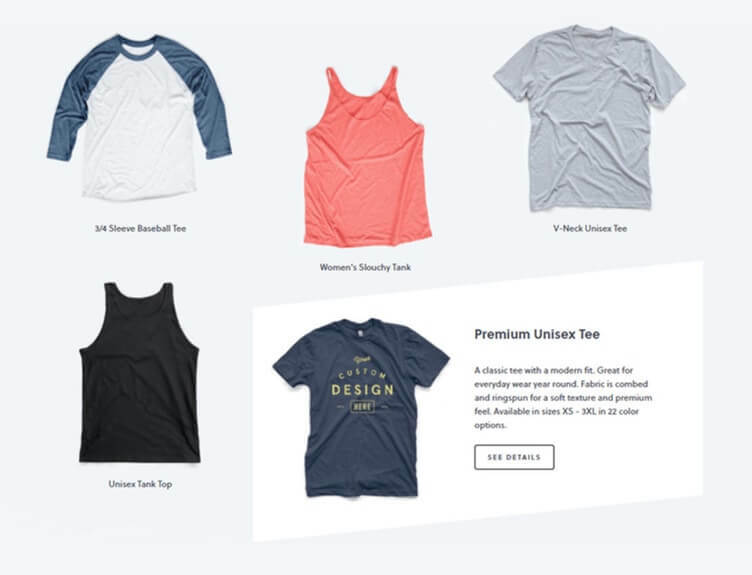 If you choose to offer your shirts through an online crowdfunding campaign, Bonfire gives you the freedom to set your own prices and fundraising goals. This essentially means that the success of your custom t-shirt campaign depends on how extensively you promote your shirt’s crowdfunding page. Your church, friend group, family, and social media followers are all perfect audiences for your fundraising t-shirt. Bonfire provides some easy tools to customize your campaign description and share your page online to help get you started! Custom t-shirts are among the most effective mission trip and personal fundraising ideas. Your family and friends will be excited to support you, and members of the broader community will be rewarded for their support with a well-designed shirt! 5 Church Crowdfunding Strategies to Maximize Your Gifts. Check out our top picks for ways to help your church engage the community and raise some funds! Types of Church Fundraising Letters from Snowball. Read through this exhaustive resource on church fundraising letters for guidance composing your next message. Make Your Own Custom Merch: The Quick Guide. All kinds of creatives need to create their own custom merchandise. Here’s our guide to getting started! Are you ready to create a mission trip t-shirt?